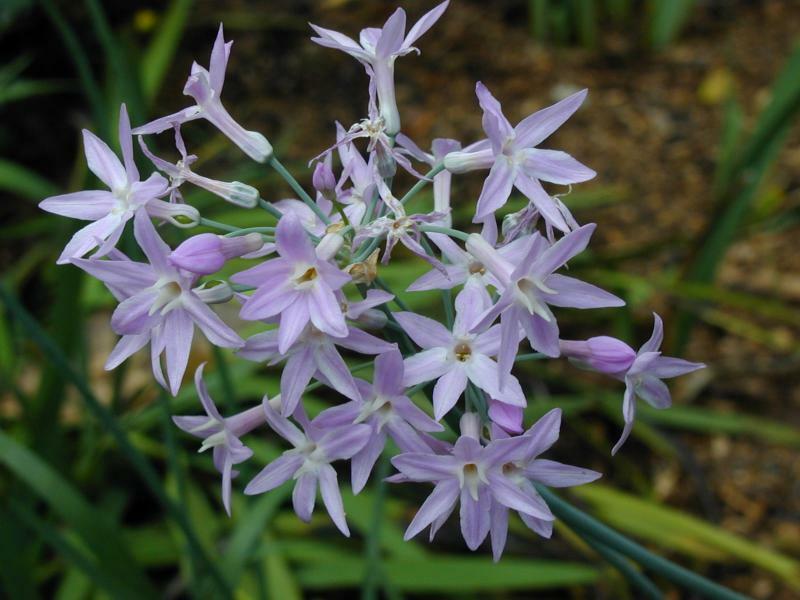 Relatives include onions, Clivia, Eucharis, Narcissus and Nerine. Flowers tubular opening to six petals, up to 1 inch long, in rounded clusters at stem ends. Stems leafless, 12-24 inches long. Plant is a herbaceous perennial from tuberous roots, classed as a monocotyledon. Flowers have a slight garlic odor. The common name for this plant originated from the belief that it could be used as a substitute for garlic without risk of offending social companions later in the evening. However, it is grown mainly for ornamental purposes and some authorities caution against its consumption, stating it may cause vomiting. The Zulus of South Africa grow this plant around their homes to repel snakes. Genus named for Ryk Tulbagh, governor of Cape of Good Hope in the 1700’s. The specific epithet name “violacea” means violet, in reference to its flower color. One popular variegated cultivar is T. violacea ‘Silver Lace.’ Its white-striped leaves are interesting even when plants aren’t in bloom. It is more widely grown, though less vigorous than many other species and cultivars. A lesser-known species, T. fragrans, has wider leaves and sweetly scented flowers. The rarer T. natalensis is a pleasing small, white-flowering species, with little green central cups turning to yellow.